Float Tubes, often named as Belly Boats are the most affordable kind of boats for fishing. The best thing about these float tubes is they do not take extra space in your garage. Portable in the feature, float tubes are an all-time favorite for the anglers then and now. The price of float tubes is also affordable. In short, float tubes are the compact form of boating and fishing combo without wasting excessive money, space and time. The weight capacity is imperative because the boat will hold you and it must be enough strong to bear you. The weight holding capability usually depends on the design of your float tube and the materials that are used in the construction of the boat. The body weight is not the only concern while considering the weight lifting capacity. One primary concern of the weight lifting capability of a float tube for fishing is to hold the accessories and fishing pliers. When utilizing a floating tube, you have to keep in mind that at all times it requires retaining a specific amount of air. So, you better purchase float tubes for fishing that is made of hardy and sturdy material. Materials or fabrics that are abrasion-free and resistant rips and tears are highly recommendable. Rip-stop fabrics are one of the toughest material for float tubes. No matter if your tube is brushed up against any kind of abrasive surface, the tears will not appear in the fabric as it is sturdy. You will need to store all your necessary accessories in you float tube while fishing. This is because you have to keep your accessories and gears at a stage that is upper than the water level. Floating tubes with raised pockets are highly advocated. Some of the float tubes of these days come up with best spinning rod holders for making your journey easier. If your boat doesn’t have the features then make sure it has the option for attaching additional rod holders. If you want to take a lot of gears like the best spinning reel, fishing gloves, best fillet knife then D-rings along with the other attachments are necessary to keep the space free. Look for these. Fittings of the boat is a crucial concern. Among all types of float tubes that are available in the market, the round floating boats and the U shaped floating boats are the most basic classification. The round shaped mainly shaped in form of donuts and has got added seat. In the water, this kind of floating tubes sits low. But these are easily controllable and maneuverable for the anglers. The beginners or the newbie may find it easy to ride these boats. The other floating tubes which are U shaped are much larger than the round shaped floating tubes. Forgetting in and out of the boats effortlessly, these boats have got one removable crossbar. Unlike the donut-shaped floating tubes, these boats sit in a higher position. Weight capacity of the floating tubes is very much important. If you are a little heavy or the angler who is going to use the boat is a bit weighty then you have to go for a boat that can comfortably bear you otherwise the boat will make you unsafe. The other thing you have to keep in mind is floating tubes are not like kayaks that are hi-tech and featured in a technically perfect way. So, if you are a newbie in controlling and riding a floating tube then you have to be cautious. It will not be an easy job for you because running floating tubes require practice. If you want to be a seasoned rider or angler then you have to keep practicing. You can purchase one pair of flippers for practicing. If you want to go for paddles then you can select small paddles as they will be handier than the larger ones. A plastic sculling paddle will also match perfectly with your floating tube. Wind can be a negative phase if you are fishing with float tubes but if you want then you can use it as your advantage. Usually, the wind that is blowing it can be helpful but if the wind is blowing out then it can be dangerous. But in the offshore, it is totally different. Float tubes are considered as intimate fishing rigs. If you can use it properly, you can go closer to the fish with its help. 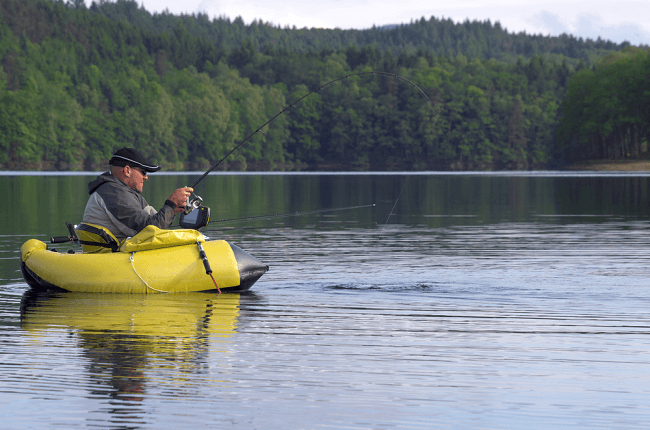 You have to careful while selecting the area of fishing with a float tube. For the belly boats, traditionally small lakes and ponds are the desired water spots. But some more areas on any large water-body can turn into your float tube fishing spot. Shorelines and the coves are protected from wind and so you can look for these places. Powerboat traffic areas must be avoided, rather you have to try to stay near the shore. This is because large boats will not see you and your float tube is not safe among the boats. Is fishing float tube safe? Yes, float tube for fishing is safe. But you have to be careful and wear Personal Floatation Device. Try not to use float tubes in moving water. Can float tubes be used in the river? We recommend you not to use float tubes in river, ocean or any kind of moving water. If you do they try to stay close to the shore. How many people can ride in a float tube? Different float tubes have different weightlifting and seating facility. There are float tubes for one person, two persons, and three persons. Float tubes for fishing are popular because they have an open body for easy fishing. These small boats are popular for fly-fishing for the largemouth bass, lure or trout. You should wear the PFD (Personal Floatation Device) for your safety as in some location this is a must. Long vacations are good but nothing can be better than a weekend fishing in the native lake or waterbody with your very own family and a float tube! If you are adventurous, go fishing in a float tube. Float tubes are challenging as well as mood soothing.